Wealthy British created a seaside resort in Dinard during the “Belle Epoque”, with hosts as prestigious as the Prince of Wales and Agatha Christie. 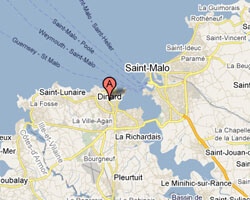 It has kept old seaside villas in a beautiful location, facing Saint-Malo. A coastal trail offers beautiful views. At the seaside you can find sandy beaches variously oriented along a rugged coastline. 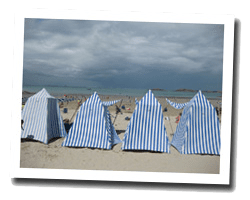 In Dinard enjoy a seaview holiday rental. Panoramic sea view of saint-malo, in a classified ancient villa on the "Malouine" area, close to beach and shops. 1 Bedroom(s), 1 double bed(s). Final cleaning : 40 €. In the castle of Moulinet, Apartment. Terrace, shared garden. distance from town centre: 400 m. Nice view of the sea and the beach. Villa Gulf Stream offers self-catering studios located in the coastal town of Dinard, and overlooking the sea and 450 metres from the beach. All studios include free Wi-Fi access. Nice duplex apartment in a ancient priory, shared park with direct access to the beach. 2 Bedroom(s), 1 double bed(s). Final cleaning : 60 €. duplex Apartment in a renovated ancient priory. 80 sq. m . 3rd and last floor with lift. beautiful view of St Malo ,Dinard,St Servan -Solidor. - Direct access to the beach. private car park. high end residence. Apartment 1 rooms 33m2. Close to town centre. terrace. balcony. 4 rooms apartment 100m2. Close to town centre. terrace. Pets allowed. Villa Gulf Stream offers self-catering studios facing the sea located 450 metres from the beach. All studios include free Wi-Fi access.